Binotto offers an extensive range of chassis mounted hydraulic oil tanks, in steel material and are finished in grey RAL 7021 epoxy powder coating. 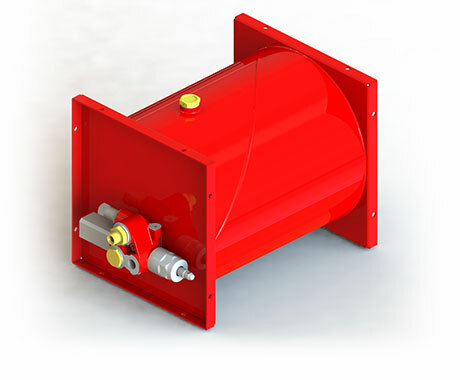 Designed for installation to small or light duty tipping trucks, these hydraulic oil tanks are compact, rounded in shape and feature square integrated side mounting end plates to ensure installations to be easy and uncomplicated. 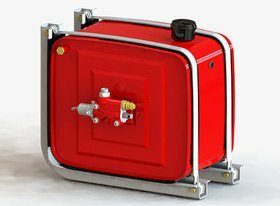 With a range of variants in sizes from 10 litre capacity up to 60 litre capacity, Binotto chassis mount oil tanks are suitable to fulfil all tipping requirements for any light duty tipping trucks, offering superior reliability and durability. This range of oil tanks have mounting plates to allow the installation of a proportional tipping valve, either mechanical or pneumatic activated, offering flow rates from 40 litres up to 80 litres and pressure settings from 140 bar up to 300 bar. 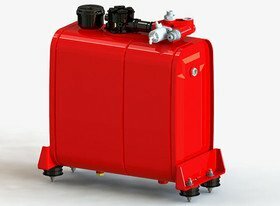 On the larger size of oil tanks flow rates are suitable up to 150 litres. All of the proportional tipping valves have built in adjustable safety control. All variants are equipped with a 10 micron air breather filter, with optional components (such as ball valves, hoses, adapters, filler cap extension,... ) which can all be combined with our range of hydraulic oil tanks. With such an extensive range, we can surely accommodate your requirements with our current selection, If there is a size not shown that you require please contact our team.